Planning your flight on time is the only possible action to take to prevent delayed travels and unexpected inconveniences. Knowing when the flight will take off, the exact time to arrive at your destination, and the list of activities overseas will help you to curb the possibility of wasting time and the risk of losing money. Even more interesting is the fact that you can use a remade flight Itinerary Template to create your arrangement plan. 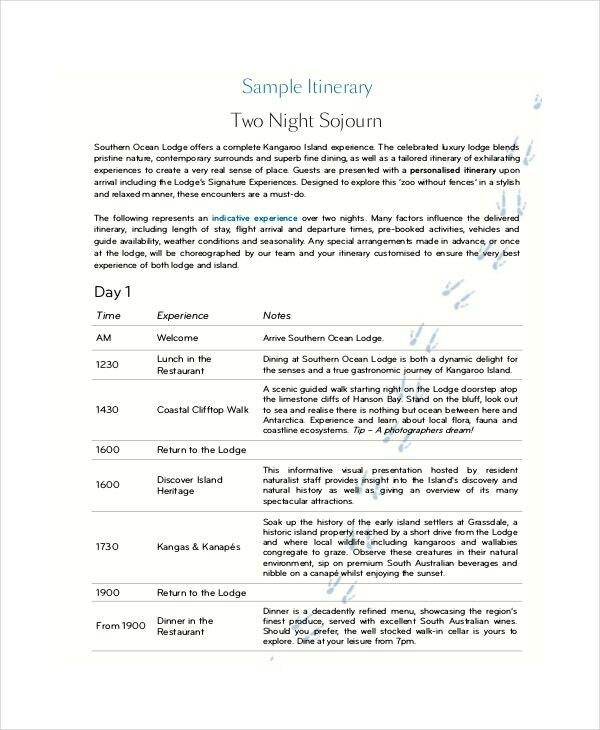 The following is a list of example sample travel itinerary templates. All the places you would like to visit, the foods you would like to eat, the people you would like to meet, and where you would like to stay during a vacation flight should all go into an itinerary template. As long as you know what places to visit, the people you are likely to meet, and the possible sites to visit, using this template to plan your itinerary should be easier. The PDF file is free to download. It is important to stay organized before, during, and after traveling. 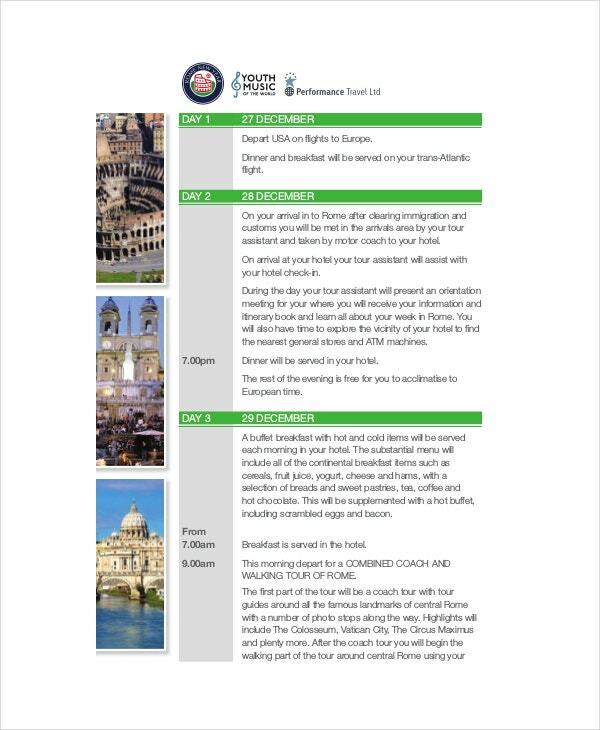 This itinerary should aid you keep everything in place and make it easy to track all your travel plans everyday. 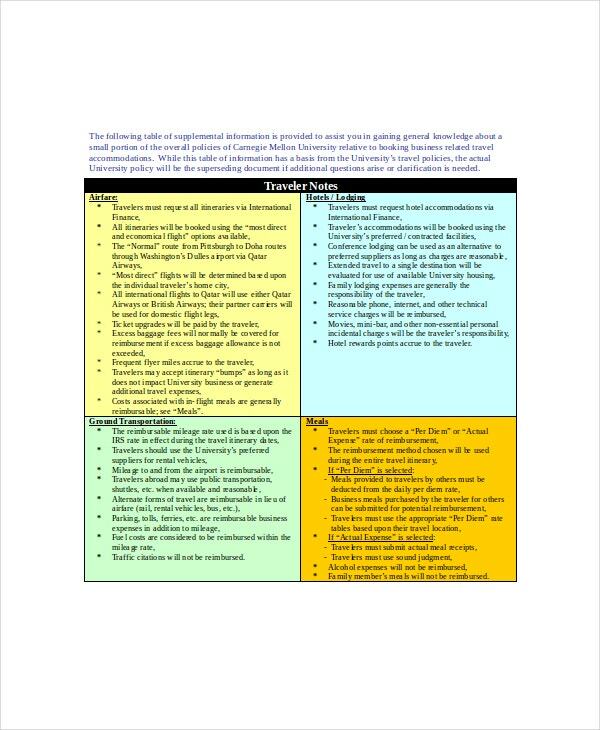 By using this template, you can write a vacation plan that will help you to never miss a thing. All the best travel destinations, cool restaurants, amazing exhibits, and whatever else you l think you should see, must go into an itinerary. The template gives you some cool travel ideas that you can add to your travel plan before the actual travel date. If you don’t know how to plan your travel, this template should be helpful enough. 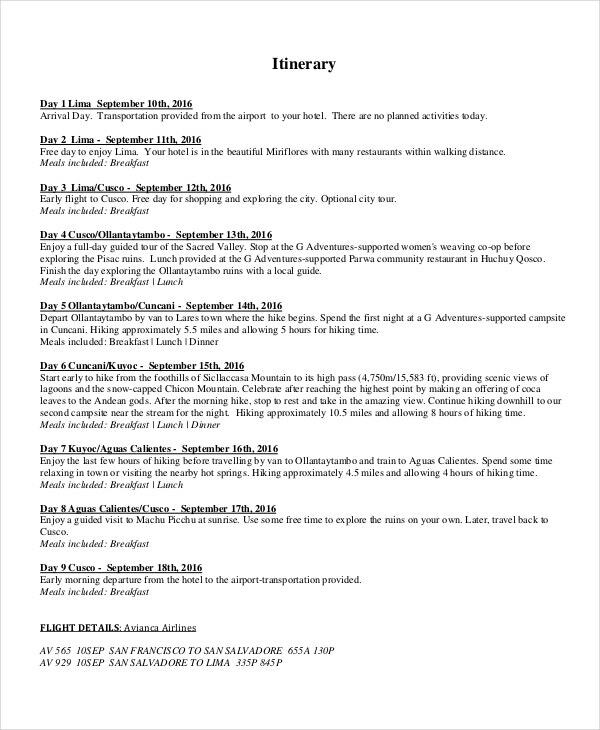 You can use an itinerary template to create a list of places you would like to visit during a vacation. Whether a place is a must-hit in your list or a destination you have never been to, you can outline it all on an itinerary list. Also, you can use the template to determine what you should pack before flying. By understanding the places you are likely to visit, the people you will end up meeting, and the sites to see, you can determine the best attire for every escapade by writing it all on your itinerary templates list. Whether you are travelling for a business trip or a family vacation, an itinerary is the single most valuable tool for planning what you will eat, where you will check in places you will visit, and the people you would like to interact with before you travel. Once the plane takes off, you can travel rest assured that you are going to have a good time out there. How you plan the travel really depends on you. You can plan it all at once before you take the flight, or you can use the itinerary template to plan your travel on a daily. You can also see Party Itinerary Templates. 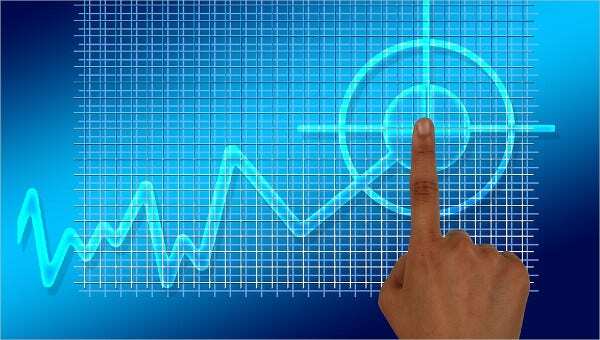 In looking for cheaper and quick option for the best travel plan templates, people always look for cheaper ones. 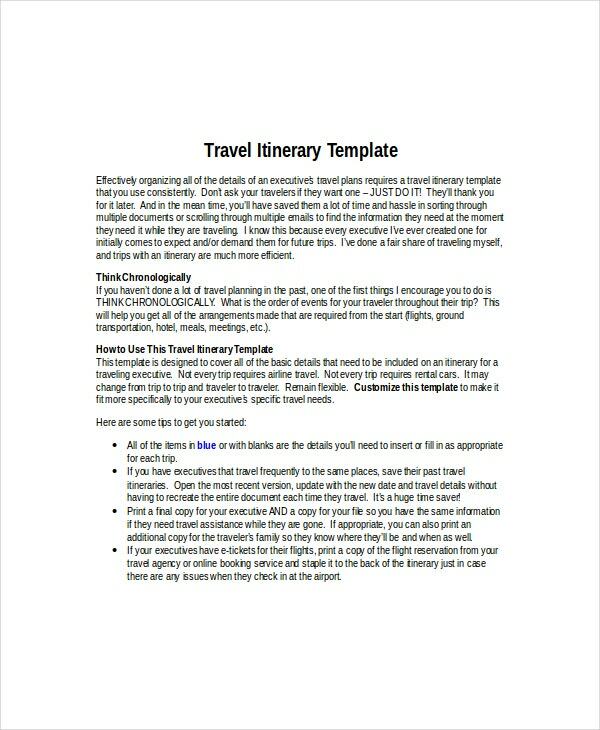 Luckily, these templates are the cheapest because you can download them for free and use them for pre and/or post travel planning. Unless necessary, there is no real reason why you should be customising the template at all. 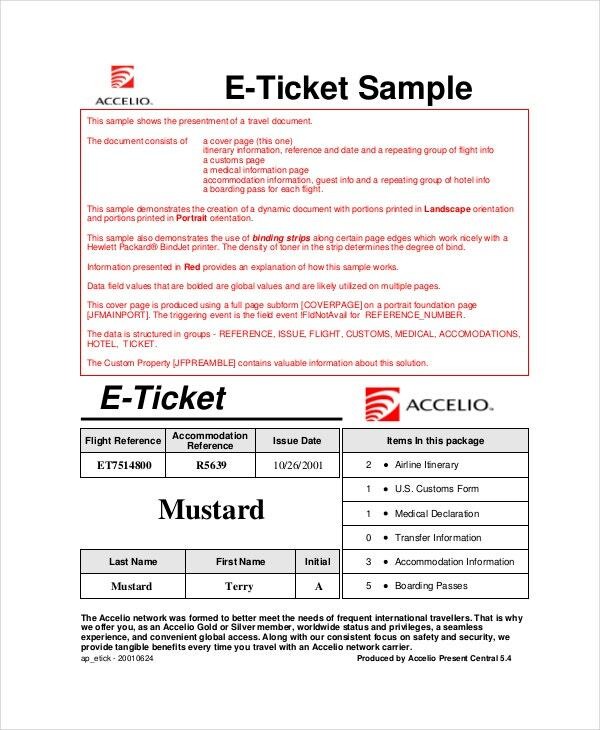 All you have to do is to download the template, print the document, and use it exactly as it is. The only way to enjoy your travel overseas is to create a comprehensive itinerary. Doing so eliminates the likelihood of overthinking and making bad travel choices. Moreover, you end up spending your money the right way from the first day of your vacation to the time you travel back home.